Typhoon Mario Storm Signal and Affected Locations #MarioPH update is brought to you by state weather agency PAGASA as of September 19, 2014 at 1:00 AM. 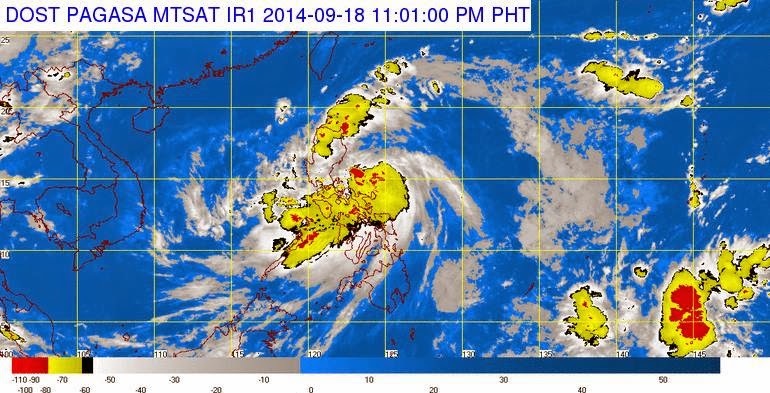 The center of Tropical Storm #MarioPH was estimated 367 km East of Baler, Aurora (15.6N, 125.0E). Max winds/Gust: 65/80 kph. Storm Signal No. 2 has been raised to six areas and Signal No. 1 other ten areas on Thursday night as Tropical Storm Mario (Fung-Wong) continued to move toward Northern Luzon.